Now, the retailers can browse the products being offered by farmers under various categories like fruits, vegetables and exotics. The app also tracks the retail ordering behaviour and predicts demand using machine-learning technology. Helping the farmers with technological advancements to build a better supply chain process, Crofarm, a B2B agri-tech company has launched its mobile application. 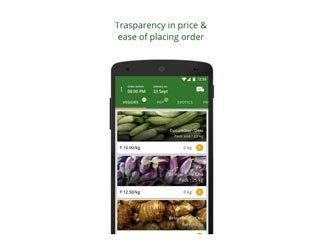 The new app will enable retailers to procure the freshest produce straight from farmers at the best prices possible. With transparent pricing, ease of order placement and enhanced features such as doorstep delivery, the Crofarm app will eliminate middlemen from the entire supply chain process of procuring produce from the farmers and offer unparalleled ease and convenience to retailers at the same time. The app can be downloaded by registered retailers for free of cost from Google Play store. Now, the retailers can browse the products being offered by farmers under various categories like fruits, vegetables and exotics. The app also tracks the retail ordering behaviour and predicts demand using machine-learning technology. This helps it to guide its customers with regard to their respective order size in order to prevent wastage. The application also increases the order trackability and provides status information to the retailer at multiple steps. After a successful trial run with leading retail stores in Delhi-NCR, Bangalore and Mumbai, the platform at present experiences a demand of around 750 ton fruits and vegetable on a monthly basis. The premium services of the platform are actively being availed by BigBasket, Grofers, FoodWorks, Reliance Retail, Metro, and Big Bazaar as well as local vendors in these markets. Crofarm aims to deliver cost-effective fresh farm produce to retailers. It enhances demand discoverability and the effective reach of farmers. Its overarching goal is to eliminate the redundant mandi system, which not just pays meagre prices to farmers but also charges exorbitant rates from retailers.